Castello is an attractive collection of sofas and chairs that will make a welcome and comfortable addition to any traditional living space. Choose from a 3 seater or 2 seater sofa plus a matching chair with the useful option of a manual or power reclining seat. If mobility is an issue why not relax with total piece of mind in the Castello Riser Recliner Chair. Compact proportions mean that each sofa and chair will fit even the smallest of living rooms. 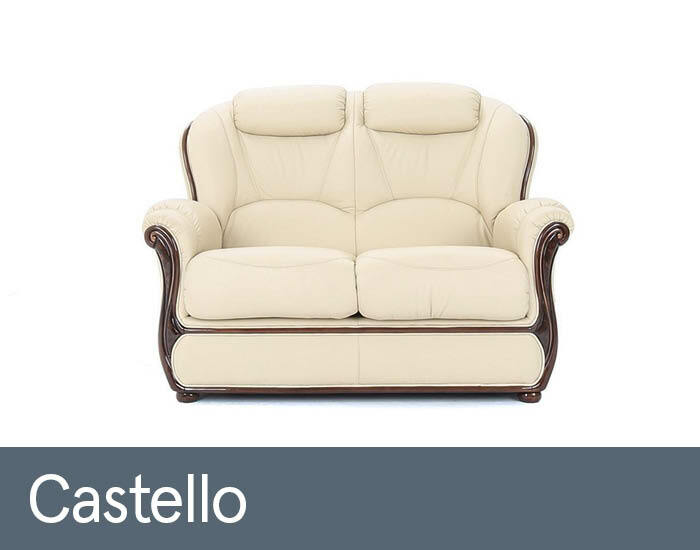 Castello’s neat arm detailing and understated wing feature are perfectly enhanced by the designs fine showood frame, which is available in a choice of colours and finishes. Not only does Castello offer classic high back appeal but it has both integral lumbar and head supports for optimal comfort and relaxation. A feature further enhanced by the range’s option of manual or power reclining chairs. If performance and resilience are a primary concern, there’s no need to worry – quality, switchable foam seats complemented by a fully sprung seat platform and hardwood frame take care of this. Why not complete the look with a useful footstool, whether storage or standard. This can act as a coffee table or additional seat in tighter spaces, as well as a well deserved foot rest.